Behind consecutive finals victories by Jordan Averett (138), Clint Brownell (145) and Sage Nugent (152), and top-four finishes by Justin Bowie (113), Brier Babin (120), Jesse Braud (132) and Jordan Averett (182), the St. Amant Gators won the Zachary Big Horse Open for the second consecutive year. The Gators scored 173.5 points, edging out runner-up Live Oak (168.5) by five. Live Oak had five titlists, followed by St. Amant and Baton Rouge with three apiece. This marked the first tournament championships of the season for Averett, Brownell and Nugent, with Brownell and Averett having placed second three and two times respectively in previous events. 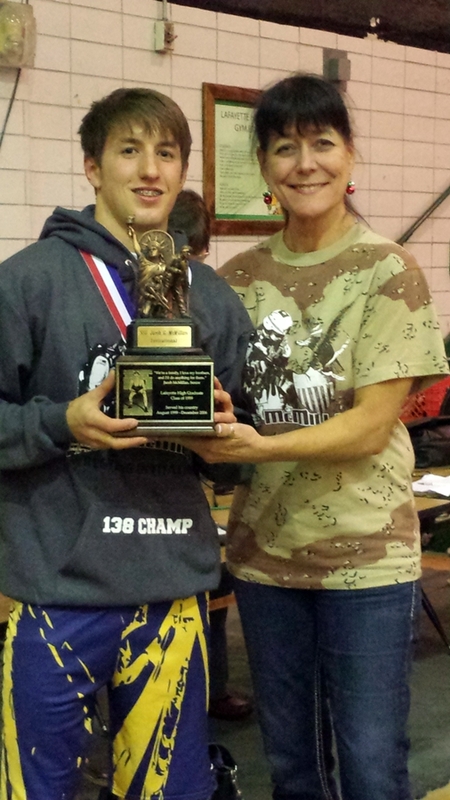 Brownell also won the award for the most pins. Live Oak had five title winners. Winning championships for the first time this season were Mason Middleton (113), Colt Olinde (120), Brennan Webb (132) and Nicholas Simeneaux (220), while Brody Bonura (182) picked up his fourth. Third place Baton Rouge had three champions with Micah Roby (126), Jarrett Moss (160) and Thomas Stremlau (170) each notching their second tournament wins. At 106 pounds Central's Austin Gouedy won his second 2014-15 championship, as did Hahnville's Kendrick Jones at 195 pounds. 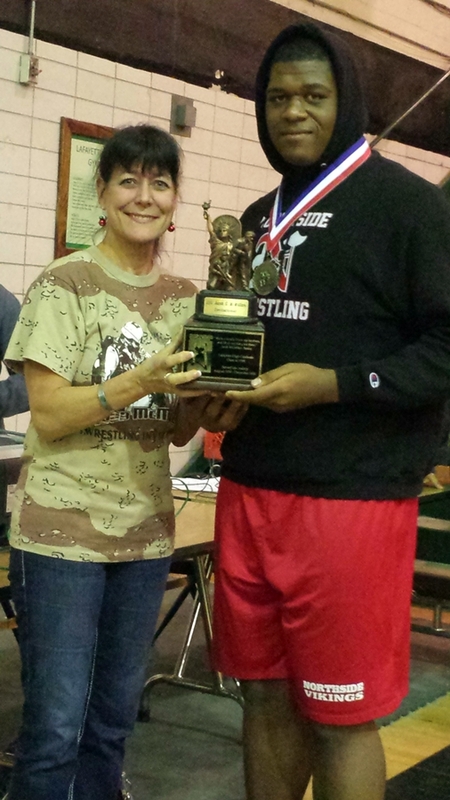 Also earning his first title of the season was Zachary's Chris London at 285 pounds. Hunter Fitch (126) and Jake Verret (132) won championships while Blake Menard (106), Jayce Menard (113) and Kole Miller (160) earned runner-up spots as Comeaux won the Jacob McMillan Memorial Tournament by a comfortable 34 point margin. 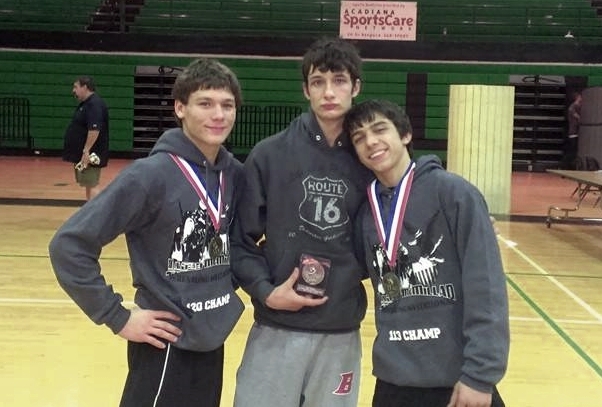 Host team Lafayette placed second (158 points) and Basile, with 147 points, place third. Basile, who won the Eagle Open last week, had three champions in Gavin Christ (113), Raymond Bushnell (120) and Gavin Cortez (145). (Photo left, courtesy of Kevin Bushnell, shows Bushnell, Zack Vinson and Christ). 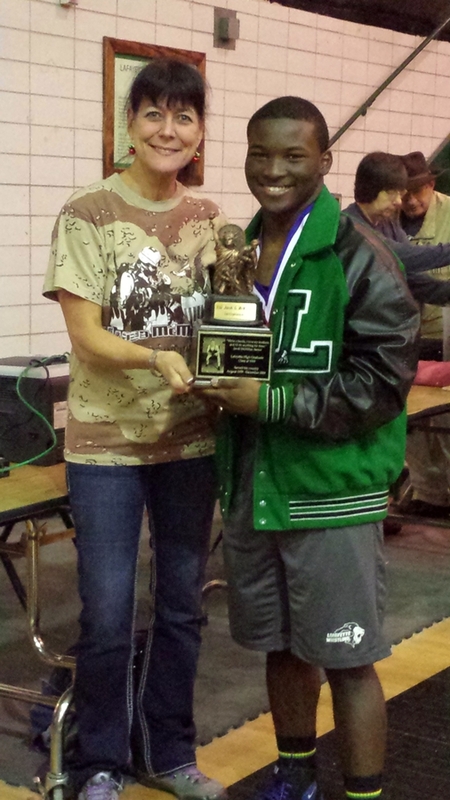 Host Lafayette also had three winners in Thaquan Priestly (152), Jalen Dixon (160) and Rodrigo Diaz (220). Sulphur had two champions in Kevin Fuselier (106) and Brennan Taylor (138), as did Northside with Cozenski Alfred (170) and O'Shea Dugas (285). The remaining titles were won by Acadiana's Eric Duhon, Jr. (182) and Rayne's Andrew Arceneaux (195). Acadiana's Raven Guidry had the best tournament of her young career. Following a short experience with eventual runner-up Blake Menard in the weight class in which the boys may weigh no more than 106 pounds, the sophomore went through the consolation bracket with a fall in 0:30, followed by successive 11-5 and 11-6 victories, and finally falling one match short of making the consolation finals. Holy Cross placed third, one spot lower than last year, but this year they had a champion at the Las Vegas Holiday Classic. Senior George Benoit, seeded third, scored a 10-5 finals match win over top-seeded Storm Roper of Liberty High School of Henderson, Nevada. The 74-team event was won by California's Victor Valley with 207 points. Liberty High School of Arizona placed second with 196.5 points, squeaking past the Tigers' 193. Two other Tigers made it to the finals. Colin Guerra, seeded third at 126 pounds, advanced to the finals with a fall in 3:46 over second-seeded Jace Roundy of Cedar City, Utah, before falling 6-2 to top-seeded Ted Rico of Combs, Arizona. Second-seeded Brice Duhe advanced convincingly to the 170 pounds finals with a semifinals fall in 1:05, but allowed two points late in the third period in a 7-5 loss to Armon Fayyazi of Irvine, California. Following a tough 5-4 quarterfinals loss to Basha, Arizona's Nico Braswell, third seeded sophomore Jake Rando advanced to the 145 pounds consolation finals with wins including a 19-3 technical fall, a fall in 1:55 and a 3-1 decision. To place third Rando gained sweet revenge by defeating Braswell 7-5. 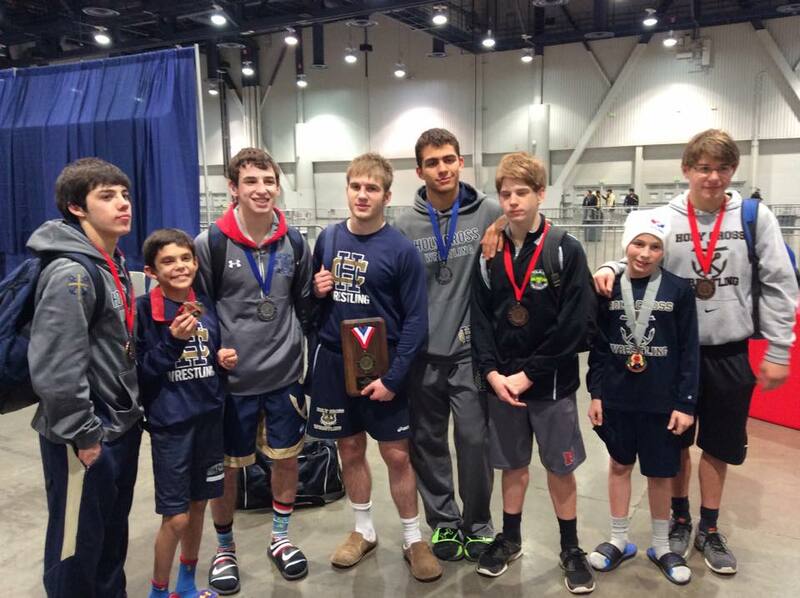 Jeffrey Argrave (113 pounds) placed seventh for the Tigers and Chris Zea (106 pounds) place eighth. Jesuit's Guy Patron, Jr. placed second in a formidable Kansas City Stampede field rife with teams from Iowa, Oklahoma and Missouri, and included Archer, GA, the winner of last summer's Jazz Town Duals, Platte County, MO, who will be at the Deep South Bayou Duals in late December, and Allen, TX, who will be at this week's Trey Culotta Invitational. Patron, Jr., who was seeded second in the 35-man field at 182 pounds, won his pool on Friday with two first-period falls and a 15-0 technical fall. In the championship bracket on Saturday he registered two more first period falls before a tough 3-2 semifinal win over sixth-seeded Kyle Hostetter of Neosho, Missouri. Patron fell behind early in the finals and was not able to catch-up to fourth-seeded Jordan Derringer of Stillwater, Oklahoma in a 4-2 loss, Patron, Jr.'s first setback of the season. 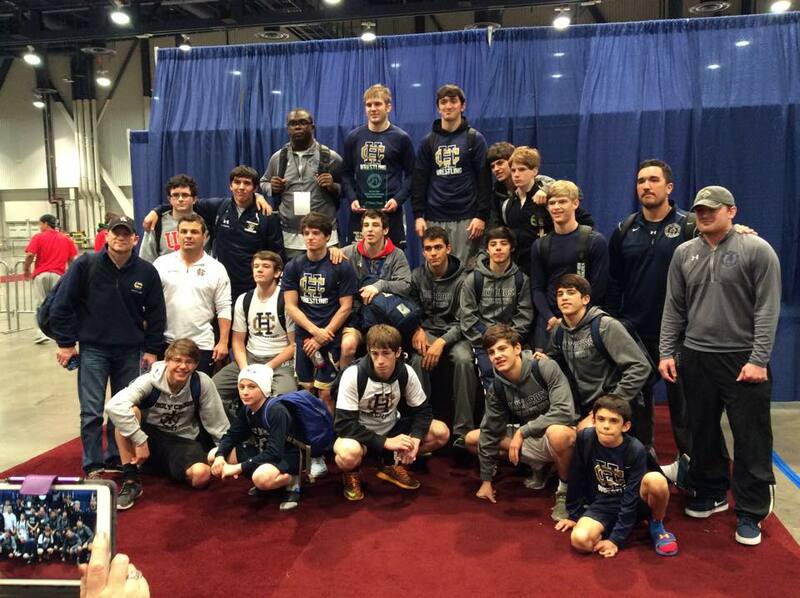 According to SportsNOLA.com, Catholic defeated Brusly 43-19 in the Beast of the Beach finals. As yet no information on this event is available.